The Roamer is the first ever truly portable booth. With it's Li-Ion battery pack and powerful wifi it can work anywhere, indoors or out. 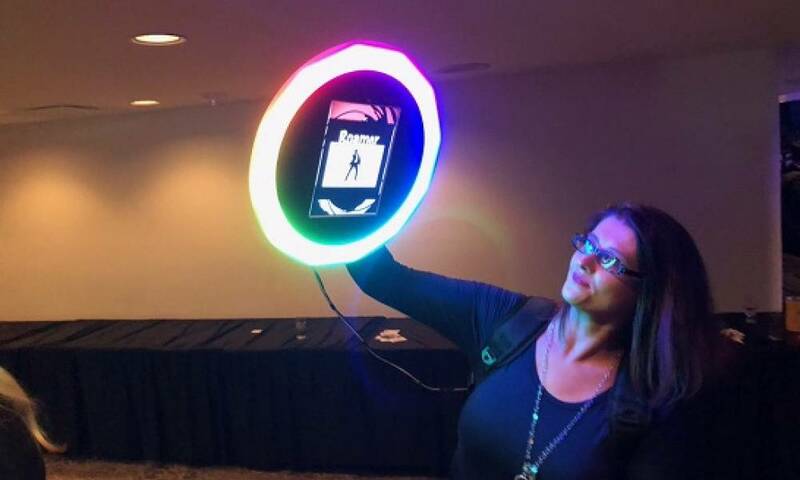 The stunning rainbow led lighting attracts attention and when the operator presses the trigger the beauty light switches to soft white for stuuning photographs, GIF's and Boomerangs. Ideal for Music Festivals, Sports Events, Rock Concerts, Film Premieres, In-store promotions, in fact anywhere a Booth couldn't go before! Your own staff can operate it and you can have multiple units covering large events. It's designed to be rolled out at large scale events and priced to enable that! The Roamer Booth is a lightweight marvel packed with the latest tech and utilises the power of the newest iPad Pro. You get full branding of the start up screen, branded overlays on all the stunning photographs and very shareable GIF's and Boomerangs, and of course all the Social sharing hastags and messages preset for you. Guests enter a mobile number or email, then receive a link to a branded microsite. They click to share on Instagram. Twitter or Facebook on their already logged in smartphones. No trying to remember usernames and passwords! So what happens at a festival like Glastonbury, or at a big Football match, or F1 Race when you try and send photos? Nothing! No Wifi signal at large events is a common problem, but we've allowed for that. We use powerful portable WiFi units with antennae and multiple SIM cards so if there is a signal you will get it. But if not the software is designed to queue the photos, GIF's and videos you shoot. When the operator pops back to the Base area to swap batteries or for a break, we will have hard wired Internet connections ready to send everything. Of course if there's no phone signal the guests won't be expecting their creations. But as soon as they get a signal they will! And that's when the social sharing starts and the traffic flows! Printing works the same way. If you want to go out into a crowd and send people to your brand you just point out that that they can have a free printed photograph by visiting your base area. There we set up a photolab with iPads for guests to browse their images and print instantly. It's also nice to let them jump on your guest Wifi and grab their texts and email, whilst of course receiving their Roamer Booth creation! We work with you before the event to get all the branding approved, then we can ship the units to you in special Pelican cases ready to turn on and use! We can also man them for you of course. And we will attend and setup the base stations and photo labs if required. We also support remotely and can get on the screens to support your staff. You get full support from us.